I’m an assistant professor in Integrative Biology at UC Berkeley, and a curator at the University Herbarium. I’m a proud and happy graduate of the Arts & Science Program at McMaster University, the Biology Department of Duke University, and the Biodiversity Research Centre at the University of British Columbia. I also had many formative/memorably/amazing experiences on the interpretive staff of Algonquin Provincial Park and in the Science and Conservation Department of Royal Botanical Gardens. I enjoy long moonlit walks in rocky fern-rich montane habits. 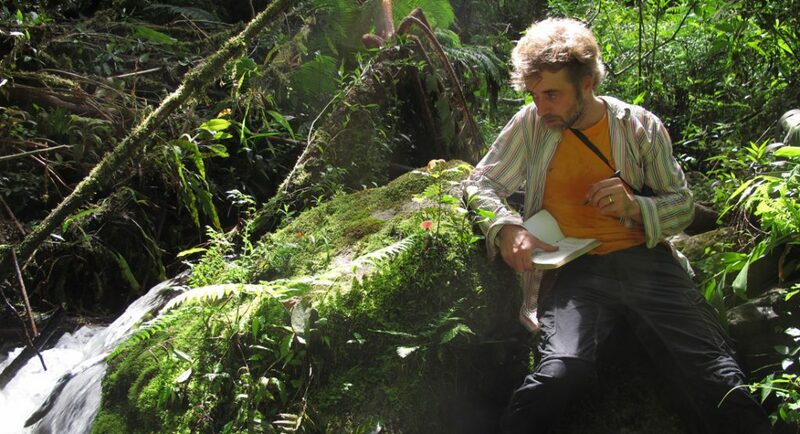 Observing a likely-undescribed river-loving species of Cystopteris near Oxapampa, Peru. For more recent publications, see the main publications page, and/or my Google Scholar profile. Wickett, N.J., S. Mirarab, N. Nguyen, T. Warnow, E.J. Carpenter, N. Matasci, S. Ayyampalayam, M. Barker, G.J. Burleigh, M.A. Gitzendanner, B. Ruhfel, E. Wafula, J. Der, S.W. Graham, S. Mathews, M. Melkonian, D.E. Soltis, P.S. Soltis, C.J. Rothfels, L. Pokorny, J. Shaw, L. DeGironimo, D. Stevenson, B. Surek, J.C. Villarreal, B. Roure, H. Philippe, C.W. dePamphilis, T. Chen, M. Deyholos, J. Wang, Y. Zhang, Z. Tian, Z. Yan, X. Wu, X. Sun, G.K-S. Wong, J. Leebens-Mack. 2014. A phylotranscriptomics analysis of the origin and early diversification of land plants. PNAS 111(45): E4859–E4868. Rothfels, C.J, K. Johnson*, M.D. Windham, K.M. Pryer. 2014. Low-copy nuclear data confirm rampant allopolyploidy in the Cystopteridaceae (Polypodiales). Taxon 63(5): 1026–1036 *Undergraduate mentee. Rothfels, C.J., and E. Schuettpelz. 2014. Accelerated rate of molecular evolution for vittarioid ferns is strong and not driven by selection. Systematic Biology 63(1): 31–54. doi:10.1093/sysbio/syt058. Sundue, M.A, and C.J. Rothfels. 2014. Stasis and convergence characterize morphological evolution in eupolypod II ferns. Annals of Botany 113(1): 35–54. doi:10.1093/aob/mct247. Rothfels, C.J., Larsson, F-W. Li, E.M. Sigel, L.Huiet, D.O. Burge, M. Ruhsam, S.W. Graham, D. Stevenson, G.K.-S. Wong, P. Korall, K.M. Pryer. 2013. Transcriptome-mining for single-copy nuclear markers in ferns. PLoS ONE 8(10): e76957. doi:10.1371/journal.pone.0076957. Rothfels, C.J., D. Windham, and K.M. Pryer. 2013. A plastid phylogeny of the cosmopolitan fern family Cystopteridaceae (Polypodiopsida). Systematic Botany 38(2): 295–306. Rothfels, C.J., E. Gaya, L. Pokorny, Paul Rothfels, Peter Rothfels, and G.R. Feulner. 2012. Five new records for the Arabian Peninsula and other significant fern, lichen and bryophyte collections from the UAE and northern Oman. Tribulus 20: 4–20. The results of a family vacation gone horribly wrong. Rothfels, C.J.*,A. Sundue*, L.Y. Kuo, A. Larsson, M. Kato, E. Schuettpelz, and K.M. Pryer. 2012. A revised family-level classification for eupolypod II ferns (Polypodiidae: Polypodiales). Taxon 61(3): 515–533. *Equally contributing. Rothfels, C.J. *, A. Larsson*, L.-Y. Kuo*, P. Korall, W.-L. Chiou, and K.M. Pryer. 2012. Overcoming deep roots, fast rates, and short internodes to resolve the ancient rapid radiation of eupolypod II ferns. Systematic Biology 61(3): 490–509. COVER ARTICLE. *Equally contributing. Johnson, A.K. *, C.J. Rothfels, M.D. Windham, and K.M. Pryer. 2012. Unique expression of a sporophytic character on the gametophytes of notholaenid ferns (Pteridaceae). American Journal of Botany 99: 1118–1124. *Undergraduate mentee. Rothfels, C.J., M.D. Windham, A.L. Grusz, G.J. Gastony, and K.M. Pryer. 2008. Toward a monophyletic Notholaena (Pteridaceae): Resolving patterns of evolutionary convergence in xeric-adapted ferns. Taxon 57(3): 712–724. Carl’s first fern love, the notholaenids. Jaramillo, A., M.T.J. Johnson, C.J. Rothfels, and R.A. Johnson. 2008. The native and exotic avifauna of Easter Island: Then and now. Boletin Chileno de Ornitologia 14(1): 8–21. Rothfels, C.J. 2004. Significant vascular plant records from the Hamilton area, Ontario. Canadian Field-Naturalist. 118(4): 612–615. Rothfels, C.J., L.L. Beaton, and S. Dudley. 2002. The effects of salt, manganese, and density on life history traits in Hesperis matronalis from oldfield and roadside populations. Can. Journal of Botany 80: 131–139. My undergraduate thesis, in which all the plants died. Johnson, M.T. and C.J. Rothfels. 2001. The establishment and proliferation of the rare exotic plant, Lythrum hyssopifolia, (Hyssop-leaved Loosetrife), at a pond in Guelph, Ontario. Can. Field-Naturalist 115(2): 229–233. Back in the dawn of time, Marc Johnson and I published a paper, and we were very excited! It has even been cited. (0nce).